Rosetta is an ESA deep space mission whose main objective is to rendezvous and orbit around the comet 67P/Churyumov-Gerasimenko in order to perform observations of its nucleus and coma. Studying the evolution and the increase of activity of the comet on its trajectory to perihelion, Rosetta will give insights into the formation of our Solar System, and the origin of water and life on Earth. Launched from Kourou aboard Ariane 5 on 2 March 2004, the spacecraft arrived at the comet after a 10-year heliocentric journey including four gravity assists (one by Mars and three by Earth), two asteroids flybys (Steins in 2008 and Lutetia in 2010), and three years of deep space hibernation. Orbiting 67P/C-G and accompanying it on its trajectory around the Sun since 6 August 2014, Rosetta deployed its lander Philae on 12 November 2014, succeeding in soft landing on a comet nucleus for the first time. Rosetta has a box-type structure with dimensions of 2.8 m × 2.1 m × 2.0 m. Its dry mass is 1300 kg while its wet mass 3000 kg. Its main propulsion system consists of 24 bi-propellant 10 N thrusters, allowing heliocentric orbit corrections and rendezvous with 67P/C-G. Two 14-m long solar panels have a total area of 64 m2 and produce power up to 8700 W, depending on the distance of the probe from the Sun. Thanks to a 2-m diameter high gain antenna, the spacecraft communicates at a data rate up to 22 kbits/s with the 35-m dish located in New Norcia station in Australia. Its nominal lifetime is 11 years. 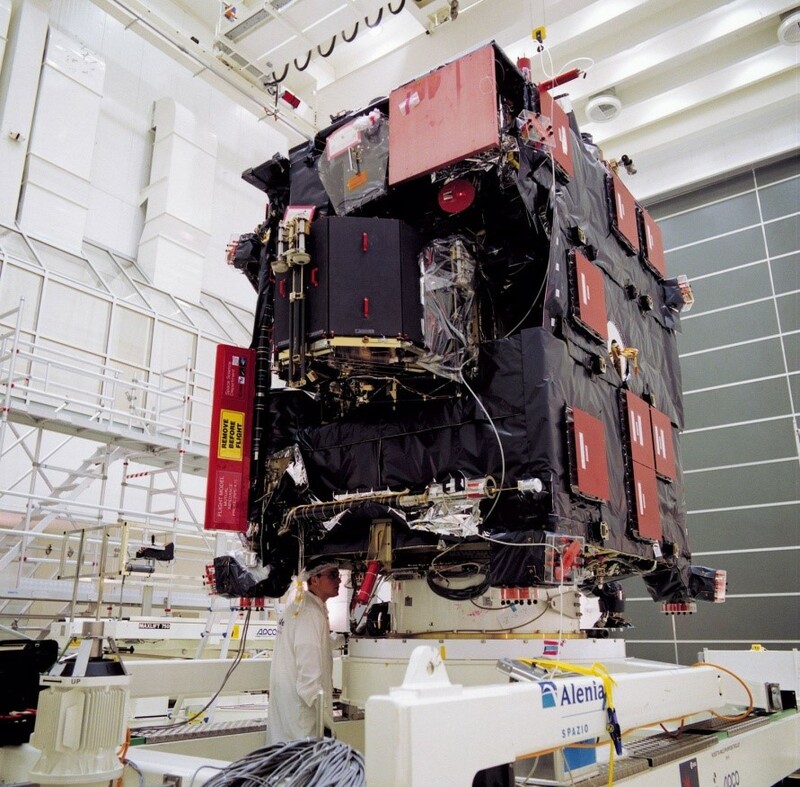 Rosetta is equipped with 11 science instruments: Alice, an ultraviolet imaging spectrometer, CONSERT, a sounding experiment for nucleus tomography, COSIMA, an ion mass analyzer, GIADA, a grain analyzer and dust accumulator, MIDAS, a micro-imaging dust analysis system, MIRO, a microwave instrument, OSIRIS, an optical, spectroscopic and infrared imaging system, ROSINA, a spectrometer for ion and neutral analysis, RPC, a plasma measurement system, RSI, a radio investigation system, and VIRTIS, a visible and infrared imaging spectrometer. Rosetta orbiter during assembly at ESA. 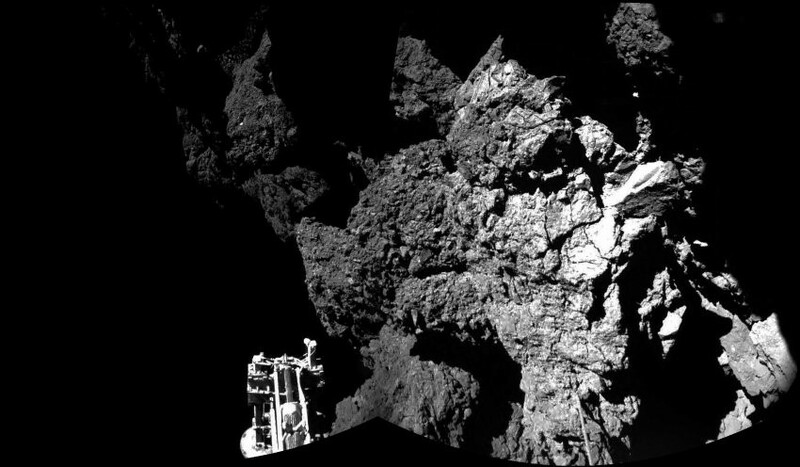 In the foreground, Philae lander (Credits: ESA). Philae has a cylindrical and hexagonal shape. It has a diameter of 1 m and a height of 80 cm. It weights 100 kg on Earth, but only 1 g on 67P/C-G. Philae carries a suite of 10 science instruments: APXS, an alpha proton X-ray spectrometer, CIVA and ROLIS, a panoramic and a microscopic imaging systems, the CONSERT experiment, COSAC, a sampling and composition analyzer, PTOLEMY, a gas analyzer, MUPUS, a surface and subsurface science system, ROMAP, a magnetometer and a plasma monitoring system, SD2, a sampling device, and SESAME, a surface electric sounding and acoustic monitoring experiment. Philae is named after an Egyptian island where an obelisk with a bilingual inscription was found, which provided the final elements French historian Jean-François Champollion needed to decipher the hieroglyphs of the Rosetta stone. To fulfill the scientific goals of the mission, several main requirements were defined for the spacecraft. First, the scientific instruments carried by Rosetta had to be accommodated on the side permanently facing the comet during the approach. Continuous measurements and view of the comet were needed to select the ideal landing site and to ensure successful operations. Furthermore, the spacecraft had to be able to navigate at low altitude around the comet’s irregular shape, accounting for its weak, asymmetric, and rotating gravity field. Last but not least, Philae has to be able to self-eject from Rosetta with a speed accuracy of 1 mm/s, ensuring an accurate ballistic trajectory for the lander. A touchdown on three unfolded legs should absorb the kinetic energy and reduce the chance of bouncing. A fired harpoon should also prevent the lander from escaping the comet’s surface. The main factors considered for defining the optimal landing site were: the conditions during descent phase and at touchdown, the physical nature of the site, the possibility of periodic communications with the orbiter, the balance between comet day and comet night, the feasibility of the CONSERT experiment, and the scientific value of the site. Descent duration, enlightenment conditions, possibility of radio link with Rosetta, speed and orientation of the lander, slope and topography of the surface, all these parameters help quantify the amount of risk taken during operations. The physical nature of the landing site is an important factor too, as the mission could be threatened by the presence of large boulders or deep cracks. The nature of the soil at landing site should also provide the scientific instruments with material samples like complex carbon chains. These carbon chains are the bricks of organic chemistry which is necessary for life to arise. Periodic communications between Rosetta orbiting the comet and Philae harpooned on its surface should be possible. Therefore, relative positions of Philae’s landing spot and Rosetta’s orbital plan had to be determined accurately. This requirement also concerns The CONSERT experiment, analyzing the interior of 67P/C-G by radio waves transmitted between Rosetta and Philae. Finally, a balanced ratio between comet day and comet night help prevent overheating the lander as well as providing enough sunlight to recharge the battery through the solar cells. In July 2014, the Landing Site Selection Group received the first photographs of the comet, revealing its binary shape. Observations and measurements made with the main orbiter’s instruments since Rosetta reached the comet in August this year helped select the landing spot. Following a 6-week period of investigation of the surface and narrowing from 10 potential landing sites using a long series of tradeoffs taking into account safety and science interests, minimizing risks and maximizing science return, Agilkia was chosen as the primary site. Named after an Egyptian island, Agilkia is located on the smaller lobe of the comet. Panoramic picture taken by Philae with the CIVA instrument after landing (Credits: ESA). After a 7-hour descent, Philae successfully landed on 67P/C-G on 12 November 2014. This date was chosen to optimize the comet’s distance from the Sun: too close to the Sun and the releasing volatiles and surface temperature could threaten the mission, too far from the Sun and the low level of radiated solar energy could prevent the lander from charging its batteries properly. Its position at around 500 million kilometers from the Sun in November 2014 ensures a good compromise. Despite a dysfunction of the anchoring system, ESA confirmed Philae’s landing in a secured position although the lander bounced two times on the surface before stabilizing. This has been deduced from the first science data sent to Rosetta for relay back to Earth. ESA published the first pictures of 67P/C-G’s surface on 13 November 2014.